Leaked poster suggests Oppo R19 may have 48MP camera sensor. It may also have a feature (similar to Pixel’s Night Sight) to click well-lit photos in low light conditions. It may have a pop-up selfie camera. The ‘48MP sensor’ is the new buzzword in the mobile industry and OEMs are working to incorporate it in their devices. While the Honor (View20) and Redmi (Note 7) have already launched phones with a 48MP camera sensor, Realme and Vivo have been reported to ship phones with it soon. Now, according to a latest leak, Chinese player Oppo has also developed the Oppo R19 with a 48MP camera sensor. Oppo may soon be looking to join its counterparts in launching a 48MP camera phone in the form of the R19, the leak suggests. The image leaked by SlashLeaks shows a phone in a poster with a Chinese caption which reads - “4800 million and night shots”. This implies that the phone could come with a 48MP sensor with an ability to shoot well-lit photos in low-light conditions. Both these technologies have gained a lot of attention lately and OEMs may soon crowd the market with devices that offer both of these. This is not the first time that a report has associated the rumoured Oppo R19 with some sort of camera tech. Previously, a it was mentioned that Oppo is working on a 10x Hybrid Optical Zoom technology and could launch it in the Oppo F19 smartphones. 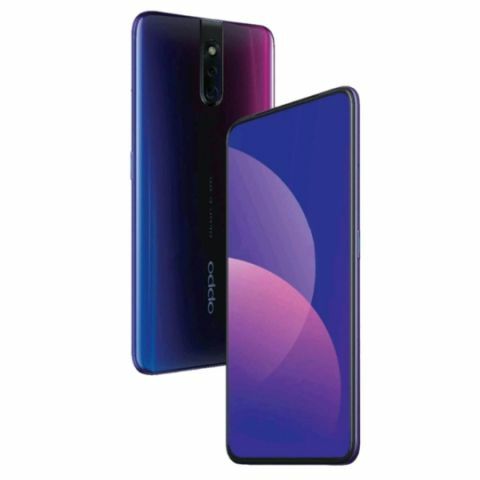 The report also mentioned a triple camera setup on the back, however, the latest leak shows a dual-rear -camera setup, resembling the leaked images of the Oppo F11. The image posted on SlashLeaks shows a dual-camera setup on the back and no visible fingerprint sensor. On the front, there is a near edge-to-edge screen with a speaker/earphone slit on the top. We cannot see a notch or punch hole on the display, which suggests that the phone has a pop-up selfie camera like it was seen in previously leaked images of the Oppo R19/Oppo F11. Reportedly, the phone’s pop-out camera slides out from the middle. Can 48MP camera sensors make your smartphone photos pixel perfect?